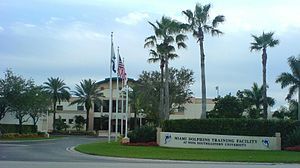 Miami Dolphins Training Facility – Target Technologies International Inc. The Miami Dolphins will be getting a brand new field in “The Bubble” at their training facility in Davie, Florida. The indoor training facility is 96,600 square feet covering 2.2 acres. This state of the art facility boasts one of the largest weight rooms in the NFL, including a therapy swimming pool, a cold plunge pool and whirlpools. We are very pleased to have the opportunity to supply our high-quality infill material for this project.